Introduction: Nasopharyngeal neoplasms are rare diseases. Due to great diversity of lesions affecting this area, all patients suspected to have a nasopharyngeal neoplasm should be submitted to nasal endoscopy and biopsy. Objective: To determine the histopathological and epidemiologic findings of the patients submitted to nasopharyngeal biopsies. Study type: Observational and transversal. Method: Through the surgical registry book of a reference otorhinolaryngology service, 16 patients submitted to nasopharyngeal biopsies during a 15-year period, from March 1991 until March 2006, were identified and evaluated. A clinical-epidemiologic analysis was carried out. Results: 8 cases were diagnosticated as epidermoid carcinomas, 1 as non-Hodgkin lymphoma, 4 as angiofibromas, 1 as tuberculosis and 1 as lymphoid hyperplasia. The benign tumors prevailed in young male patients. The malignant tumors prevailed in women in their 50's. Conclusions: Among the findings, there was a predominance of malignant neoplasms in the 5th and 6th decades, with discrete predisposition in females (1,5:1), being the squamous cell carcinoma the most prevalent (50% of the patients). Nasopharynx tumors represent 2% of all head and neck neoplasias in Europe and North America(1). The main benign neoplasia of nasopharynx is angiofibroma which is made of myofibroblast and vasogenic elements, being therefore a highly-vascularized tumor(2). It tends to local invasiveness and responds for around 0.5% of head and neck tumors. There is a clear prevalence in male patients, mainly in adolescence or pre-adolescence(2,3). The triadic epistaxis, which is a unilateral nasal obstruction and nasopharynx tumor strongly suggests angiofibroma. However, advanced lesions may bring facial edema, proptosis, neuropathy of cranial nerves and intense hemorrhage(3). The diagnosis is mainly clinic aided by nasal endoscopy and image exams (CT scan, MRI, angiography). For this reason, and due to bleeding characteristics of the tumor, biopsy before surgery is not a current procedure(2). Among the malign tumors, the main one is the nasopharynx carcinoma (NC), which occurs in its epithelial layer, being frequently seen in the pharyngeal recess which is posteromedial to the medial cruris of the opening of Eustachian tube (Rosenmüller fossa)(4). Certain regions present higher incidence of NC. There are several high-risk areas, with an incidence which is higher than 15 cases every 100,000 inhabitants per year, which cover Southern China, Taiwan, Southern Asia, Northern Africa, Greenland and Alaska(1). The NC represent 18% of all malign tumors in high-risk areas, while in Caucasians, such rate is lower than 0.25%(5). Parkin et al work has shown that the NC incidence among men and women in Hong Kong was 20-30 every 100,000 and 15-20 every 100,000, respectively(6). The histological classification of NC, proposed by the World Health Organization in 1978, divided tumors into three groups: kind I includes the typical keratinized carcinoma of scaly cells, kind II includes non-keratinized scaly carcinoma and kind III corresponds to undifferentiated carcinomas(4). In North America, around 25% of patients present kind I, 12% presents kind II and 63% present kind III(4). The most recent WHO classification, proposed in 1991, considers the mixed standards which are frequently found in tumors, besides the Epstein Barr Virus (EBV) association with kinds II and III. Therefore, the NC histological kinds may be two nowadays: scaly cell carcinoma or non-keratinized carcinomas, and this second group is divided into differentiated and undifferentiated carcinomas(7). This last classification is better applied to clinical investigation and brings prognostic value. Patients carrying NC may present symptoms of one out of four categories: 1- nasopharynx tumor (causing nasal obstruction, epistaxis or rhinorrhea); 2- tubal dysfunction (tinnitus or hypoacusis); 3- cranial base erosion (cranial nerve paralysis, cephalgia, diplopia, facial pain); 4- cervical adenomegalies. Due to the unspecified nature of the symptoms, to the affection rareness and lack of access to health services, most of patients are only diagnosed in advanced stages(4). Some studies show almost 5- month delay between the start of the symptoms and the first medical attention8. A descriptive study of 40 NC carriers revealed a mean evolution time since the first symptom until the 234-day diagnosis and showed nasal obstruction, cervical adenopathy and otitis media with effusion(1) as the main symptoms. In such study, the symptom which made the patient refer to medical attention was, in half of the cases, cervical adenopathy. The differential diagnosis of lesions which occupy nasopharynx still include Wegner granulomatosis, sarcoidosis, tuberculosis, syphilis, fungus infections and lymphoma. Amelanotic melanoma, rhabdomyosarcoma and extra-medular plasmocytoma are rare. Due to the variety of nasopharyngeal affection, it is always necessary to do nasofibroscopic exam and biopsy to diagnose the lesion(9). In Brazil, in a study done during 12 years, 37 cases of nasopharynx tumor received attention, out of which 20 were malign (54.05%) and 17 benign (45.94%). The malign histological kinds were prevalent aging from 20 to 39 years (40%) and the following cases were found: 8 cases (40%) of epidermoid carcinoma, 5 (25%) of lymphoepithelioma, 3 (15%) undifferentiated carcinoma, 1 (5%) of papillary carcinoma, 1 (5%) of neuroblastoma, 1 (5%) of rhabdomyosarcoma and 1 (5%) adenoid cystic carcinoma(10). To determine the histopathological and epidemiological results of patients who have undergone nasopharynx biopsy. This work was done in the Otorrhinolaryngology Clinic of a tertiary public hospital, after being approved by the Research Ethics Committee of such institution under protocol number 049.07.07. All patients who were hospitalized for nasopharynx biopsy between March 1991 until March 2006 (15 years) were evaluated. Epidemiological data such as gender, age and period of symptoms were retrospectively analyzed until first medical attention. In addition to this, the symptoms and signs found, as well as the diagnostic procedure performed (incisional or excisional biopsy) and the histopathological result were reported. Data related to race, exposure to alcohol and tobacco, staging and treatment could not be raised due to lack of data in the medical records. Initially, the data gathering was done from the surgery record book of the hospital, and 24 patients were found. Only 16 out of those patients were included in this study. The other ones were excluded due to the wrong registration of the medical file number in the surgical unit or due to lack of data in the medical records found (absence of histopathological result, of minimum anamnesis and of biopsy performed). 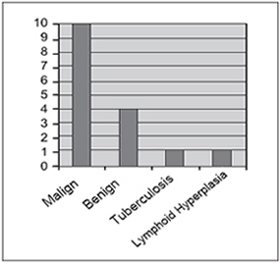 Out of the 16 patients, 10 (62.5%) presented malign neoplasia, 4 (25%) benign neoplasia, 1 (6.25%) tuberculosis and 01 (6.25%) lymphoid hyperplasia (Graph 1). Graph 1. Distribution of nasalpharyngeal lesions. The malign neoplasia occur in patients aging from 8 to 70 years old. Among them, the most frequent one was the epidermoid carcinoma (8 patients - 80%), while one of them presented non-Hodgkin's lymphoma (10%) and the histological origin was not determined due to the absence of imunohistochemical record. In terms of gender, we had 6 female and 4 male subjects. The time of start of symptoms varied between 50 days and 6 months. In 7 patients the diagnosis was obtained through curettage and, in the other three ones, through incisional biopsy under direct view with optic fiber. Only the 44-year-old patient carrying carcinoma underwent two procedures. Initially, the curettage, which was inconclusive, and posteriorly the direct view biopsy, which defined the diagnosis (see table 1). We found the following prevalence of symptoms and signs in descending order in patients with malign neoplasias: nasal obstruction (6), epistaxis (4), rhinorrhea (4), cervical lymphonodomegalia (4), otalgia (4), hypoacusis (3), cephalgia (3), cervicalgia (3), lesiono of cranial nerves (2), auricular fullness (2), loss of weight (2), cough (2), dysphonia (1), odynophagia(1), reduction of visual acuity (1), orbital pain (1), hyposmia (1), cacosmia (1). At the physical analysis, all 10 patients presented nasopharynx tumor lesion, evidenced by nasopfibroscopy or posterior rhinoscopy with indirect laryngoscopy mirror. Three of them presented otitis media with secretion, 2 lesion of cranial nerves and 1 presented "curtain sign" (purulent secretion going down oropharynx). The nasopharyngeal angiofibroma responded for all benign nasopharynx neoplasias, occurring mainly in male young patients. The time of start of symptoms varied between 30 days and I year. Two cases did not present reports of such date. Two cases had its diagnosis done by excisional biopsy and other two by incisional biopsy. Only one patient needed more than one procedure, and the diagnosis was defined by incisional biopsy (Table 2). A 25-year-old patient (Table 2) had been presenting for around 30 days dysphagia and odynophagia symptoms, in addition to loss of weight which he could not precise. He also reported bilateral hypoacusis. He denied cough, expectoration or nasal symptoms. After undergoing a biopsy of nasopharynx lesion through direct view, he presented positive research for alcohol-acid resistant bacillus and m. tuberculosis culture, thus reaching the diagnosis of nasopharynx tuberculosis. In the medical records, there were no reports of potential otoscopic, pulmonary or cervical lymphodomegalia cervical changes. Another 31-year-old patient (Table 2) carrying allergic rhinitis came with unique complaint of nasal obstruction for 1 year. His nasofibroscopic exam revealed choanal obstruction of 90% by a tissue of adenoidal aspect. He underwent a biopsy curettage which revealed only lymphoid hyperplasia, with no signs of malign disease. All patients carrying nasopharyngeal angiofibroma, all presented nasal obstruction, 3 epistaxe, 2 rhinorrhea, 1 cacormia, 1 cephalgia, 1 proptosis and 1 snoring. At the physical examination, all of them presented tumor lesion of nasopharynx, 2 rhinorrhea and 2 tumor lesion extending to nasal cavity. When the 15-year casuistic was analyzed, a problem which is inherent to retrospective studies became evident: the bad register or lack of clinical data. Therefore, 8 patients could no be included in this study. Carcinomas represent around 85% of nasopharynx malign lesions (1). In our study, 80% of the malign tumors were carcinomas, one case of non-Hodgkin lymphoma and one undifferentiated neoplasia. Skinner and cols. (8) found nasopharynx carcinoma in patients aging from 17 to 81 years, ou of which 80% aging from 21 and 60 years old and the man-to-woman proportion was 3:1. In our casuistic, patients with carcinoma aged from 39 to 70 years, out of which 87.5% aging from 40 and 70 years, and the woman:man proportion was 1:1, pointing out the little number of cases studied. When all malign neoplasias were analized, there was a predominance of patients aging from 50 to 70 years, and the woman:man relation was 1.5:1. Almeida and cols. found in 12 years in a Brazilian population 20 patients with malign nasopharynx tumors and noticed that they most frequently occurred between 20 and 39 years (40%)(10). Epstein-Barr vírus (EBV) is consistently detected in patients carryng nasopharynx carcinoma in both high-incidence and low-incidence regions, through in-situ hybridization. Pre-malign lesions of nasopharynx epithelium also hosted EBV, what suggests that the infection occurs in initial phases of carcinogenesis(4). The EBV presence was not evaluated in the study patients. All patients with malign neoplasias presented nasal symptoms, being nasal obstruction (60%), rhinorrhea (40%) or epistaxis (40%). Cervical lymphodomegalia was present in 40% of the cases. According to Fearon and col.(11), nasopharynx tumors in childhood are relatively rare, and malign neoplasia of such region correspond to around 1% of all childhood malign tumors. In this study, we did not find any childhood malign tumor. Only two patients needs more than one surgical procedure to reach a diagnosis. All other patients needed only one procedure, through curettage, by direct view or excisional curettage (two angiofibroma cases). In these two cases there was no previous clinical-radiological suspect of nasopharynx angiofibroma. Among the other rhinopharynx lesions we found 4 cases of nasopharynx angiofibroma, all of which male patients and with predominance of young adults. The most common symptoms were nasal obstruction (100%), epistaxis (75%) and rhinorrhea (50%), findings which agree on the nasoangiofibroma literatur(2). In the present casuistic, case of isolated nasopharyngeal TB was found, that is, with no associated pulmonary conditions, which is a rare condition even in endemic areas(12). In a group of 843 patients carrying tuberculosis, only 5 of them (0.6%) presented pharyngeal/nasopharyngeal tuberculosis(13). The most common symptom of nasopharyngeal TB is the cervical lymphodomegalia followed by nasal obstruction and rhinorrhea(12). Such manifestations did not occur in our patient, whose main symptoms were odynophagia and dysphagia. The case which presented lymphoid hyperplasia, biopsy was indicated once it was a recent nasal obstruction and an important adenoidal hyperplasia in a patient who was not expected to carry such problem due to age. Knowing the exact prevalence and nasopharynx tumor incidence values is an extremely difficult objective due to the fact that such disease is not a compulsory notification affection, that it is relatively rare in our environment (mainly the malign neoplasias) and that we count on a deficient hospital file. We should always observe the differential diagnosis with rarer lesions such as nasopharynx tuberculosis and the possibility of blank biopsy (hyperplasic lymphoid tissue). 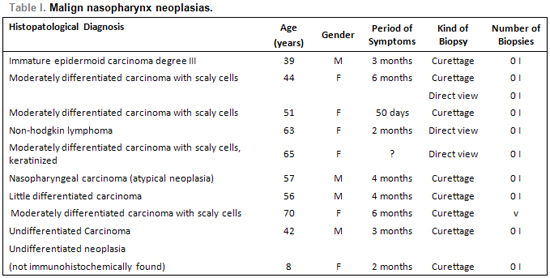 Among the hospitalized patients for diagnostic clarification of nasopharynx lesion, the malign neoplasias were predominant, among which the scaly cell carcinoma (50% of patients). The malign neoplasias were predominant among 50 and 70 years of age, with mild predominance of female gender (1.5:1). The benign lesions were represented by nasoangiofibroma in male patients, mainly young adults. The direct view biopsy was necessary in two patients to define the diagnosis after unsuccessful curettage of the lesion. 1. Plasencia DP, González JLG, Ruiz SSC, Herrera AM, Pérez MMM, Flores T, et al. Estúdio clínico descriptivo de 40 pacientes con carcinoma de nasofaringe en estádio avanzado em um área de bajo riesgo epidemiológico. Acta Otorrinolaringol Esp. 2002; 53:473-80. 2. Ricardo LAC, Tiago RSL, Fava AS. Angiofibroma nasofaríngeo: revisão de literatura. Rev Bras Otorrinolaringol. 2003; 69(3):394-403. 3. Enepekides DJ. Recent advances in the treatment of juvenile angiofibroma. Curr Opin Otolaryngol Head Neck Surg. 2004; 12:495-99. 4. Wei WI, Sham JST. Nasopharyngeal carcinoma. Lancet. 2005; 365:2041-54. 5. Lee JT, Ko CY. Has survival improved for nasopharyngeal carcinoma in the United States?. Otolaryngol Head Neck Surg. 2005; 132:303-8. 6. Parkin DM, Whelan SL, Ferlay J, Raymond L, Young J. Cancer incidence in five continents. IARC Sci Publ. 1997; 143:814-15. 8. Skinner DW, Hasselt CAV. Nasopharyngeal carcinoma: methods of presentation. Ear Nose Throat J. 1990;69:237-40. 9. Köktenera A. Nasopharyngeal tuberculosis. Eur J Radiol. 2001; 39:186-7. 10. Almeida ER, Butugan O, Ling SY, Rezende VA, Miniti A. Tumores malignos de nasofaringe (epidemiologia, tipo histológico e tratamento). Rev Bras Otorrinolaringol. 1992; 58(2):88-5. 11. Fearon B, Forte V, Brama I. Malignant nasopharyngeal tumors in children. Laryngoscope. 1990; 100:470-2. 12. Aktan B, Selimoglu E, Ünçücü H, Sütbeyaz Y. Primary nasopharyngeal tuberculosis in a patitent with complaint of snoring. J Laryngol Otol. 2002; 116:301-3. 13. Rhowedder J. Upper respiratory tract tuberculosis. Sixteen cases in a general hospital. Ann Intern Med. 1974; 80:708-13. 1. Resident Doctor of Otorrhinolaryngology at Hospital Universitário Walter Cantídio da Universidade Federal do Ceará. 2. Doctor's Degree on Medicine by Universidade de São Paulo. Associated Professor on Otorrinolaryngology at Faculdade de Medicina da Universidade Federal do Ceará. 3. Doctor's Degree on Medicine by Universidade Federal do Ceará. Associated Professor on Otorrinolaryngology at Faculdade de Medicina da Universidade Federal do Ceará. 4. Master's Degree on Pubic Health by Universidade Federal do Ceará. Associated Professor on Otorrinolaryngology at Hospital Universitário Walter Cantídio da Faculdade de Medicina da Universidade Federal do Ceará. 5. Medicine Senior Student at Faculdade de Medicina da Universidade Federal do Ceará. Otorrhinolaryngology clinic at Hospital Universitário Walter Cantídio da Universidade Federal do Ceará. Rua: Jaime Benévolo, 414, Centro, Fortaleza/CE - CEP: 60050-080. Fax. : (85) 3366-8065. E-mail: marceloalexc@yahoo.com.br.